After only 50 days in office the new Liberal government in NSW has already moved to make it more difficult to get pay rises in the public sector and has started to significantly wind back the state’s OHS laws. The NSW Premier Barry O’Farrell has announced that his government will retain the previous government’s 2.5% wages policy but will enforce it by regulation. This means the parliament will set the policy by regulation and the NSW Industrial Relations Commission will be tightly constrained by the policy. Under the last government NSW Health was required to propose offsets to be implemented after the wage increase was granted to fund any increase over 2.5%. Now, offsets will have to be implemented before nurses can get a wage increase over 2.5%. Nurses will have to put their faith in management to find the agreed employee related cost savings and deliver them to Treasury before you can contemplate getting a pay rise over 2.5%. Effectively the regulation circumvents the NSW IRC. The NSW IRC was never consulted about the loss of these powers. The real impact of this change will mean that the NSW IRC will lose its arbitration powers in relation to wage and condition setting for all cases before the Commission and all future cases. If the government’s legislation and regulations are passed by the NSW upper house it will have a direct impact on NSW members in ADHC in the coming award negotiations and the rest of the Public Health System after 2013. NSWNA members should cast back their memories to 2007 when we predicted before that year’s state election that the Liberal Party, if elected, would introduce WorkChoices or alternatively they would neuter the NSW Industrial Relations Commission. Four years on they have gone for option 2. Everything we did in 2007 and since to protect our members’ interests has been justified. During that campaign we produced a report Industrial Relations and the NSW Nurse Shortage that analysed nurses’ pay rates over the previous 20 years. It showed that access to the independent umpire of the NSW Industrial Relations Commission was absolutely critical to improving nurses’ pay. ‘The Commission had assessed nurses’ pay rates on a number of occasions since 1986 and determined that, in addition to the increases negotiated with the Health Department, significant pay increases were needed to compensate nurses for the increased value of their work: in 1986 increases ranging from 10% to 28%; 1988-90 increases for registered nurses of between 3% and 13%; and in 2003-04 increases of 9%,’ the report said. The NSW IRC should retain its rights and responsibilities as the independent umpire to arbitrate outcomes. 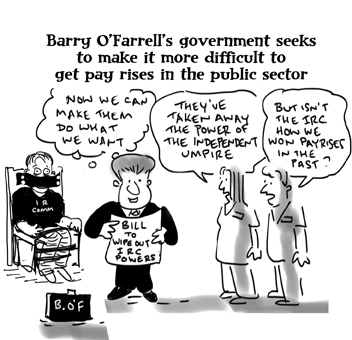 The O’Farrell government’s proposed laws would reduce it to a rubber stamp on government wage policy. The government has also moved quickly to weaken the state’s OHS laws. A new OHS bill removes the right for unions to take prosecutions. Unions will have no right to request WorkCover to bring a prosecution for any breaches that take place between now and 30 June 2012 – nearly a whole year. This OHS bill waters down the duties of employers. The former ‘absolute duty of care’ required under NSW OHS laws will be qualified to ‘as far as is reasonably practicable.’ This change effectively removes the ‘reverse onus of proof’ that ensured that an employer who was being prosecuted had to show why they had not been negligent or failed to comply with the legislation. It will make it much harder for WorkCover to succeed with prosecutions. The passing of the OHS bills had, as the Lamp went to print, been held up in the upper house. The only possibility that could stop the bills becoming law lies with the cross benchers: the Shooters and Fishers Party and Fred Nile and the Christian Democrats.